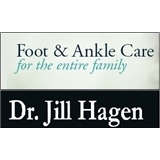 Dr. Jill Hagen - Podiatrist (Englewood) - Book Appointment Online! Dr. Hagen loves feet and has dedicated her life to making feet happy and healthy. Her patients will tell you she is knowledgeable, compassionate and caring. You can trust her advice and skills, which are backed by more than twenty six years of experience and expertise. Dr. Hagen offers the absolute latest in cosmetic and corrective foot care, including laser surgery, toe shortening, cosmetic foot surgery for more beautiful feet, shock wave and radiofrequency for heel pain and alcohol injections for neuromas. Her knowledge of sports medicine makes her a popular choice for athletes who suffer foot and ankle injuries such as heel or arch pain, tendonitis, bursitis or fractures. Dr. Hagen employs state-of-the-art techniques such as minimal incision surgical techniques and intraoperative fluoroscopy, which shortens surgery time and reduces postoperative complications. The doctor and staff were friendly and very helpful. My daughter received excellent attention and arrangements were made for follow-up.